In the United States (U.S.), racial and socioeconomic segregation has created unequal access to opportunity with both acute and cumulative impacts. Neighbourhood aesthetics, safety, and access to and quality of services (childcare, education, retail, etc.) may ultimately translate into resident health. This has been brought to light in at least a decade’s worth of public health literature [1, 2, 3, 4, 5]. Regular physical activity (PA) is also known to contribute to positive health outcomes, including lower incidence of cardiovascular diseases, diabetes, depression, certain cancers, and obesity. Increasing evidence suggests that there are associations between neighbourhood features that are conducive to PA (e.g., parks, trails, PA facilities, safety) and engagement in PA [6, 7, 8, 9, 10]. Such neighbourhood resources, sometimes referred to as the Physical Activity Environment, have been shown to be less plentiful in neighbourhoods with low socioeconomic status residents and/or a high percentage of racial/ethnic minorities [11, 12]. In addition, neighbourhood physical and social characteristics from housing, landscaping, and sidewalk conditions to social cohesion and employment have also been shown to predict health and well-being as well as PA and active transportation [13, 14, 15, 16, 17, 18]. Thus, investing in the neighbourhood environment, particularly in low income or racially/ethnically isolated neighbourhoods, has been deemed a promising strategy to potentially improve resident health, including physical activity, mental health and related outcomes. Yet much of the available evidence on associations between neighbourhood characteristics, the PA environment and resident activity has been cross-sectional, [9, 19, 20, 21] and few studies [22, 23, 24, 25, 26, 27] have assessed health outcomes, including PA, on the same residents both before and after a substantial change in the physical environment. Thus, it is still unclear whether self-selection biases are responsible for the significant associations between features of the environment and health outcomes, or whether there are specific neighbourhood characteristics that may lead (causally) to health or health behavior improvements. Further, much of the current evidence base around physical activity has employed self-reported measures . Given the awareness of biases in self-reported data, [29, 30, 31] it is important to establish a body of evidence that relies on objective assessments. Consistent with the prior cross sectional studies that have linked neighborhood characteristics such as landscaping and sidewalks to physical activity, [6, 7, 8, 9, 10] we hypothesized that following the completion of these improvements, residents of the Hill District neighborhood would experience increases in physical activity, active transportation and psychological precursors to physical activity, increases in positive neighbourhood perceptions and satisfaction, and decreases in psychological distress relative to residents of Homewood observed over the same time period. Specifically, we expected that the improved aesthetics and walkability of the residential environment (i.e. the new buildings, sidewalks, plantings, and street crossings) would reduce perceived barriers to PA and shift intentions, spur residents to walk to the new grocery and to existing retail venues (increasing active transportation), and motivate them to walk more often for exercise or leisure to explore and enjoy the new areas. We also hypothesized that these improvements would improve residents’ well-being and their perceptions of and satisfaction with their neighborhood. In contrast, we expected little if any change among residents of the comparison neighborhood, Homewood, where physical changes were less substantial. 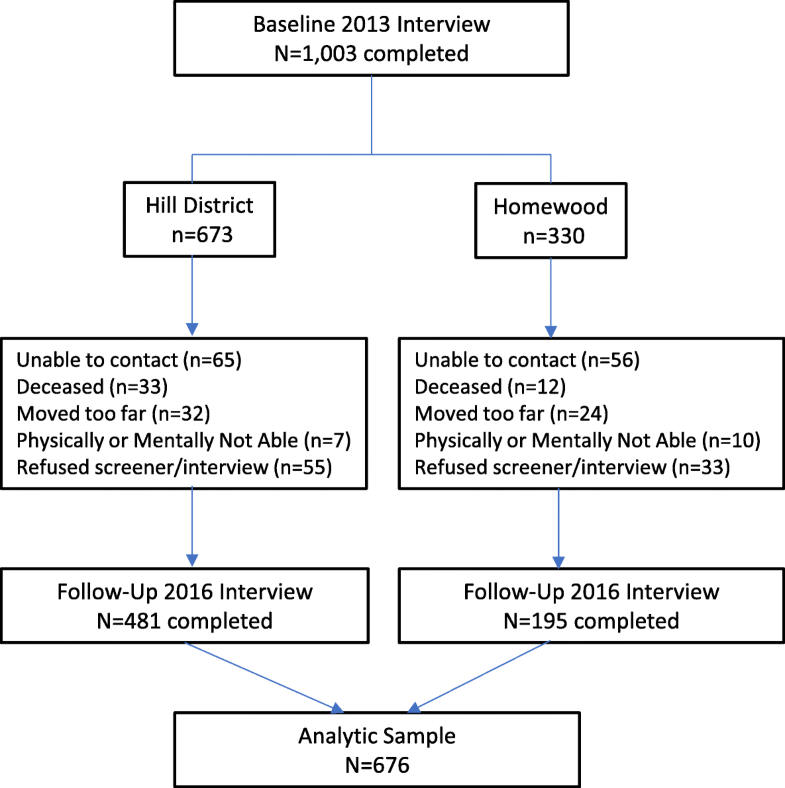 The Pittsburgh Research on Neighbourhoods, Exercise and Health (also called ‘PHRESH Plus’) was built upon an earlier study (PHRESH), which began in 2011, and was designed to examine the impact of the opening of a full-service supermarket in the Hill District on resident diet and food shopping behaviors [34, 35, 36]. In 2011, the Hill District and Homewood neighbourhoods were socio-demographically and geographically matched. The Hill District was 1.37 mile2 (population of 10,219), while Homewood was 1.45 mile2 (population of about 8300). Residents of both neighbourhoods were predominantly African-American with median household income less than $15,000 [37, 38]. The sampling strategy for the enrolled cohort from the two neighbourhoods is described elsewhere [34, 35, 36]. Briefly, the original PHRESH study drew a stratified random sample of residential addresses in the two study neighborhoods, from a master list of addresses obtained by merging Allegheny County Office of Property Investment data with the Pittsburgh Neighbourhood and Community Information System. 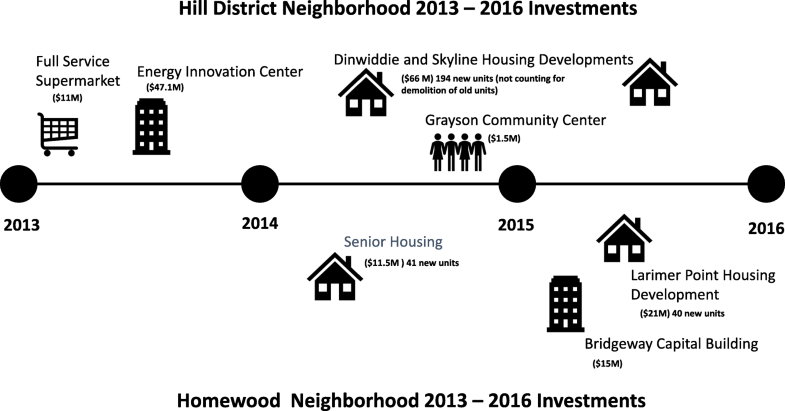 By design, households in the intervention neighbourhood (Hill District) were oversampled; 897 were enrolled in the intervention and 475 in the control neighborhood (Homewood) for a total sample of 1372 in 2011. In 2013, prior to the supermarket opening and the PHRESH follow-up, PHRESH Plus re-surveyed 1051 (response rate of 77%) of the original study participants, collecting PA and related measures for the PHRESH Plus baseline. Of the 1051, 1003 still lived within the boundaries of the study neighborhoods in 2013 and were included in this study. At the PHRESH Plus follow-up assessment in 2016, PHRESH Plus interviewed 676 of those 1003 households (76% response rate). Our analytic sample includes these 676 cases [i.e., those with both a baseline (2013) and follow-up (2016) interview and still residing in one of the two neighborhoods]. We have provided a breakdown of the sample by group in Fig. 2. Neighbourhood satisfaction  was assessed by asking, “All things considered, would you say you are very satisfied, satisfied, dissatisfied, very dissatisfied or neutral – neither satisfied nor dissatisfied, with your neighbourhood as a place to live?” Others have used this single item question to understand residents’overall perceptions of their neighborhood [51, 52, 53, 54]. This item was dichotomized with the highest two levels (satisfied or very satisfied coded as 1, and neutral, dissatisfied or very dissatisfied coded as 0) . We also assessed psychological precursors to physical activity, all of which have been previously developed and validated [59, 60]. 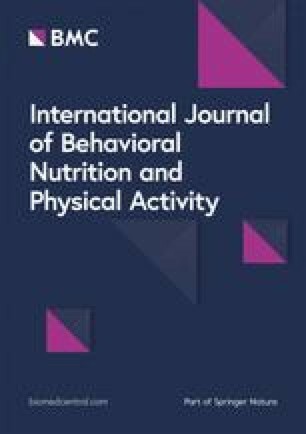 These included social norms (e.g., “How often do your friends or family participate in physical activity such as walking, jogging, bicycling, or playing sports?”);  intentions to engage in PA, (“Do you intend to engage in physical activity three or more times a week for at least 10 minutes at a time during the next year?”) [62, 63, 64]. Barriers to PA (eight items  with a 5-point response scale). Self-efficacy to engage in PA over the next 6 months in the face of a variety of barriers (10 items with a 10-point response scale) . To create a measure of PA outcome expectancies, participants were asked whether they agreed (on five 5-point response scales) that if they participate in physical activity they will experience a variety of positive outcomes (e.g., “feel less depressed”, lose weight) [67, 68, 69]. Responses were averaged.